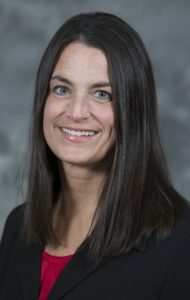 Alison Doyle with the Iowa State University Research Park has been recognized with a “Service to Business Education” award by the Iowa Business Education Association (IBEA). The IBEA annually recognizes individuals who have made major contributions to business education in the State of Iowa. Doyle received the award during the 2016 IBEA Fall Convention held in Des Moines, IA. The program is offered as an Occupational Experience course for eligible students at Ames High School with no additional charge to the student. It allows students who complete the program to receive three hours of Des Moines Area Community College (DMACC) college credit through the Career Advantage partnership between DMACC and area high schools. As part of the project, Doyle acts as a business mentor for the students in the Ames program, guiding them on the selection and progress of their projects. According to her nominators, Doyle has also been successful in marketing the program, bringing new businesses in, and securing additional job site hosts and business mentors for the next school year. “This has required a large amount of time and commitment on her part, which Alison has readily given to make this program a reality and overall success,” said Hales and Schmaltz. Doyle has been with the Iowa State University Research Park since 2008.